At REPS you can expect fast turnaround, low prices, great service & guaranteed quality! The Bay Area's premier marketing tools for Real Estate professionals! Need more time to sell? REPS (Real Estate Promotional Services) has the experience and creative talent to get your projects done on a deadline. We will make your projects look great and get your message across clearly and concisely. Offer home buyers professional flyers that showcase your properties! 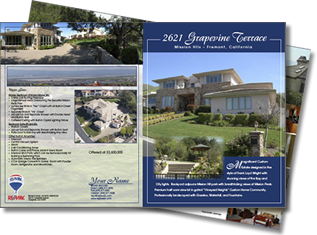 Choose from simple color flyers or multi-page brochures that offer exceptional design and presentation for your homes. Use one partner to produce all of your real estate marketing tools! Property flyers, postcards & mailing services? Whatever your needs and goals, REPS is here to make you projects shine. With our broad range of services and expertise, we can help you not just complete your projects, but bring them to life. From our graphic designers, print production artists, mailing department and onsite digital photographer we have what it takes to develop, create and deliver all your projects on time. We are one stop shopping for your marketing needs. Start your design projects today! At REPS we offer quality brochures, postcards, mailings & virtual tours. Save your sanity and your time by working with an established provider of marketing tools for the real estate industry. Call today and speak with customer service or one of our design consultants. Call (408) 871-8586.